Another wonderful collage workshop with Dale. This piece includes some of my own artwork printed on paper towels and paper napkins then a gel medium is applied. Using paint, gold leaf, and copper leaf for additional layers. 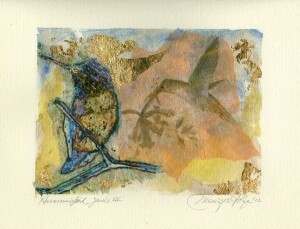 I have also added additional painting strokes to the two humminbirds on the right side of the image. Something interesting came to mind once I completed this piece not intentionally. 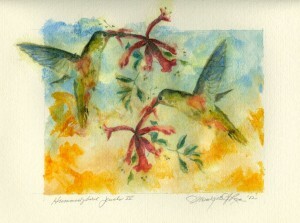 It reminded me of the Navaho legend, how the hummingbird lost it’s song. The symbolic images of this piece reflect that legend. I share this legend in my hummingbird talks. It is a charming legend and worth reading or coming to one of my talks to hear it. 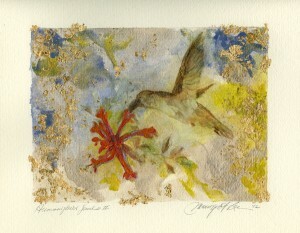 The hummingbird loses it’s song but becomes the “jewel of nature,” that we see today. 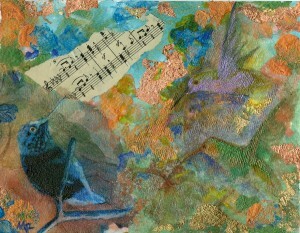 These pieces are a series of hummingbird collages that I have called “Hummingbird Jewels.” Each are individual with my hummingbird art as the focal point. These collages are available for sale. Please contact using e-mail address, monique@mfrartwork.com , if you are interested in purchasing.